The Los Angeles Metro Rail is an urban rail transportation system serving Los Angeles County, California. It consists of six lines, including two rapid transit subway lines (the Red and Purple lines) and four light rail lines (the Blue, Green, Gold and Expo lines) serving 93 stations. It connects with the Metro Busway bus rapid transit system (the Orange Line and Silver Line) and also with the Metrolink commuter rail system. 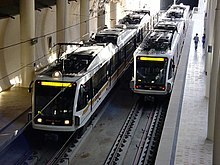 Metro Rail is owned and operated by the Los Angeles County Metropolitan Transportation Authority (Metro) and started service in 1990. It has been extended significantly since that time and several further extensions are either in the works or being considered. The system served a ridership of 344,176 on an average weekday in 2018. Los Angeles had two previous rail transit systems, the Pacific Electric Red Car and Los Angeles Railway Yellow Car lines, which operated between the late 19th century and the 1960s. The Metro Rail system utilizes many of their former rights-of-way, and thus can be considered their indirect successor. In Los Angeles Metro terminology, common with most other metro systems, a line is a named service, defined by a route and set of stations served by trains on that route. (The word does not refer to a physical rail corridor, as it does in New York City Subway nomenclature.) Metro Rail lines are for the most part named after colors, and these colors are used to distinguish the lines on Metro's maps. (The one exception is the Expo Line, which nevertheless is consistently colored aqua on maps.) Metro also uses colors for its Metro Busway services (which are bus services operating in transitways). The Red and Purple lines follow a fully underground route (subway), and the Green Line follows a fully elevated route. The Blue, Expo and Gold Line routes run in a mix of environments, including at-grade street running, at-grade in an exclusive corridor, elevated, and underground. The two heavy-rail lines (Red and Purple) share tracks between Union Station and Wilshire/Vermont, while two of the light-rail lines (Blue and Expo) share tracks between 7th St/Metro Center and Pico. Future system expansions are expected to use shared light-rail tracks. Stations include at least two ticket vending machines, wayfinding maps, electronic message displays, and bench seating. Each station features unique artwork reflecting local culture and/or the function of transit in society. Metro Rail uses a proof-of-payment fare system, with Metro's fare inspectors randomly inspecting trains and stations to ensure passengers have a valid fare product on their Transit Access Pass (TAP) electronic fare card. When passengers enter a station, they encounter TAP card validators which collect fares when a customer places their card on top. Additionally, fare gates (turnstiles) connected to TAP card validators at all underground stations, all elevated stations and some surface stations. Once passengers pass these validators or board a train, they have entered the "fare paid zone," where fare inspectors may check their TAP card to ensure they have a valid fare. Some suburban stations have free or paid park and ride lots available and most have bike storage available. Metro Rail maintains two distinct systems of rail: a light rail system and a heavy rail system. The heavy rail and light rail systems are incompatible with each other, even though they both use 4 ft 8 1⁄2 in (1,435 mm) standard gauge. Metro's heavy rail lines are powered by third rail, whereas its light rail lines are powered by overhead catenary. Also, the two separate systems have different loading gauge, and platforms are designed to match the separate car widths. Metro has implemented a system of electronic fare collection using a stored value smartcard called the Transit Access Pass (or TAP Card). This card was intended to simplify fare collection and reduce costs. In 2012, paper monthly passes were phased out and replaced with the TAP Card. As of September 2013, first-time Metro riders must deposit an additional $2 (or $1 at TAP vending machines) on top of their first fare payment to obtain a reloadable TAP Card. In addition, Metro began installing fare gates in 2008, at all heavy rail stations and select light rail stations. Implementation of both programs (the TAP Card and the fare gate program) has turned out to be expensive ($154 million in total, so far) and its initial rollout was problematic. As of the second quarter of 2018, the combined Metro Red and Purple lines averaged a weekday ridership of 135,400, making it the ninth busiest heavy rail (rapid transit) system in the United States. Taking overall track length into consideration, Metro Rail's heavy rail lines transport 7,960 passengers per route mile, making this the fifth busiest system U.S. rapid transit system on a per mile basis. Metro's light rail system is the busiest in the United States with 203,300 average weekday boardings during the second quarter of 2018. At 83.6 miles (134.5 km) Metro's light rail system is the second largest in the United States. Half of the Metro Rail's trains and stations are patrolled by the Los Angeles County Sheriff's Department, under a law enforcement contract. The Los Angeles Police Department, and Long Beach Police Department, also patrol stations within their respective cities, also under contract. The system is also monitored by security personnel by closed-circuit television cameras in Metro Rail stations and subway cars. In the early 20th century, Southern California had an extensive privately owned rail transit network with over 1,000 miles (1,600 km) of track, operated by Pacific Electric (Red Cars) and Los Angeles Railway (Yellow Cars). However, from 1927 revenue shortfall caused Pacific Electric to begin replacing lightly used rail lines with buses. In 1958 the remnants of the privately owned rail and bus systems were consolidated into a government agency known as the Los Angeles Metropolitan Transit Authority or MTA. By 1963 the remaining rail lines were completely removed and replaced with bus service. The fiscal changes are the passage of Measure R, a countywide incrememental sales tax increase passed by voters in 2008, provides funding for many of the highest priority projects in the LRTP. On November, 6th 2012, Metro attempted to pass Measure J., but failed as it did not reach the ⅔ majority needed to pass. In November 2016 election, Metro decided to place another sales tax on the ballot. The voters then approved Measure M, a half-cent permanent sales tax increase, to fund many local projects, including Metro Rail expansion. The following rail projects have been given high priority by Metro. They all appear in the 2009 LRTP constrained plan, and all have funding earmarked from Measure R. With the passage of Measure M in 2016, Metro released an updated Long Range Transportation plan on February 2017 and will release a full report late 2020. along with its Twenty-eight by '28 initiative. Red Line To Burbank Airport Extend the Metro Red Line 3.2 miles (5.1 km) from its northwestern terminus to Burbank Airport. Included as a Tier 2 Strategic Unfunded Plan project in 2009 Long Range Transportation Plan. "Silver Line" (former name) New light-rail line planned to connect El Monte to Hollywood, via Valley Blvd corridor and Santa Monica Boulevard. Included as a Tier 2 Strategic Unfunded Plan project in 2009 Long Range Transportation Plan. Silver Line website (archived), The Transit Coalition website. ^ Chiland, Elijah (2018-12-07). "Bye 'Blue' Line, Metro will rename rail lines using letters". Curbed LA. Retrieved 2019-01-17. ^ a b "Facts At A Glance". Metro. November 18, 2016. Retrieved 2017-05-19. ^ a b "Regional Connector Transit Corridor Project Contract No. E0119 – Operations and Maintenance Plan (Final)" (PDF). 2.1 Metro Light Rail Overview. Los Angeles County Metropolitan Transit Authority. September 10, 2013. p. 2–1. Retrieved 2017-05-19. ^ Hymon, Steve (2012-08-10). "Designing a subway to withstand an earthquake". The Source. Retrieved 2019-02-25. ^ "MTA's $46M system of locking turnstiles sits unused, waiting for fare cards to be adopted - LA Daily News". Dailynews.com. August 21, 2010. Retrieved 2010-09-30. ^ "Interactive Estimated Ridership Stats". Metro. Los Angeles Country Metropolitan Transportation Authority. Retrieved 11 February 2018. ^ a b "Public Transportation Ridership Report Second Quarter 2018" (pdf). American Public Transportation Association (APTA). August 24, 2018. Retrieved January 17, 2019 – via http://www.apta.com/resources/statistics/Pages/ridershipreport.aspx. ^ "Metro – Facts at a Glance". Los Angeles County Metropolitan Transportation Authority (Metro). June 24, 2018. Retrieved January 17, 2019. ^ "LAPD Officers to Patrol Metro Buses, Trains in the City of Los Angeles". lamayor.org. February 23, 2017. ^ "Riders with Other Forms of Transport Switching to Metro". www.metro.net. September 13, 2006. Retrieved 2013-05-15. ^ Taplin, Michael (1991). "City of the Automobile: Los Angeles looks to Light Rail London". Light Rail Review 2. Platform 5 Publishing/Light Rail Transit Association. pp. 27–30. ISBN 1-872524-23-0. ^ a b c Nelson, Laura (March 5, 2016). "San Gabriel commuters cheer as Gold Line rail extension officially opens". Los Angeles Times. Retrieved 2016-03-06. ^ a b c Hymon, Steve (February 25, 2016). "17 things to know about Expo 2 opening on May 20". The Source. Metro. Retrieved 2016-05-21. ^ a b c "Long Range Transportation Plan". Metro. Retrieved 2016-11-12. ^ a b "Measure R". Metro. Retrieved 2010-09-30. ^ "Measure J". Metro. Retrieved 2012-10-21. ^ "Measure J Fails". County of Los Angeles Registrar-Recorder. Retrieved 2013-01-12. ^ "Transit Backers Seek to Change State Law". Los Angeles Times. December 4, 2012. Retrieved 2013-01-12. ^ Nelson, Laura J. (June 23, 2016). "Metro puts half-cent sales tax increase for transportation projects on November ballot". Los Angeles Times. Retrieved October 4, 2016. ^ Steve Hymon (April 7, 2015). "PowerPoint: Metro staffs proposal to rename rail and BRT lines". The Source. Metro. ^ "LA Metro Could Switch Rail Line Names From Colors To Letters". Curbed Los Angeles. Curbed Staff. April 3, 2015. ^ "Transit Program - Project Management - Project Budget and Schedule Status" (pdf). Metro. June 19, 2014. Retrieved 2014-08-16. ^ "Crenshaw/LAX Transit Corridor". Metro. March 4, 2014. Retrieved 2014-07-29. ^ "Regional Connector Transit Corridor". Metro. May 20, 2014. Retrieved 2014-07-27. ^ Steve Hymon (September 30, 2014). "Ground is broken for Regional Connector project to link Blue, Expo and Gold Lines". The Source. Metro. Retrieved 2014-11-19. ^ "Purple Line Extension (project website)". Metro. February 11, 2014. Retrieved 2014-07-29. ^ "Summer 2013 - General Fact Sheet - Purple Line Extension" (pdf). Metro. Retrieved 2013-07-25. ^ Notice to proceed issued for section 2 of the Purple Line Extension, the source.metro.net, 2017/04/27. ^ Dave Sotero (November 10, 2014). "Long wait over: groundbreaking held for Wilshire Boulevard subway extension". The Source. Metro. Retrieved 2014-11-19. ^ "Airport Metro Connector". Metro. Retrieved 2014-11-19. ^ "East San Fernando Valley Transit Corridor". Metro. July 8, 2014. Retrieved 2014-08-16. ^ "Eastside Transit Corridor Phase 2". Metro. May 6, 2014. Retrieved 2014-08-16. ^ "South Bay Metro Green Line Extension". Metro. March 24, 2014. Retrieved 2014-08-16. ^ "West Santa Ana Transit Corridor". Metro. Retrieved 2018-06-12. ^ "Sepulveda Pass Corridor". Metro. Retrieved 2014-08-16. ^ a b c d e f g h i j "2009 Long Range Transportation Plan" (pdf). Los Angeles County Metropolitan Transportation Authority (Metro). 2010. p. 31. Retrieved 2016-01-09. ^ Steve Hymon (July 9, 2014). "Transportation headlines, Wednesday, July 9". The Source. Metro. Retrieved 2016-01-19. ^ Olga, Grigoryants (17 July 2018). "LA's Metro says improvements are in the works for the Orange Line, with light rail in mind". Los Angeles Daily News. Retrieved 17 July 2018. ^ "Los Angeles Downtown News and Information". Ladowntownnews.com. May 27, 2010. Retrieved 2010-09-30. ^ Nelson, Laura J. (March 18, 2015). "Metro could expand subway service to the downtown L.A. Arts District". Los Angeles Times. Retrieved 2015-05-28. ^ Weikel, Dan (January 10, 2016). "Closing 2.8-mile transit gap in Norwalk could smooth regional commute". Los Angeles Times. Retrieved 2016-01-19. ^ "Metro Silver Line - Los Angeles Light Rail Trains from El Monte to Silver Lake // Silverline, Mass Transit". metrosilverline.com. Archived from the original on 2005-10-29. ^ "The National Transit Coalition". thetransitcoalition.us.